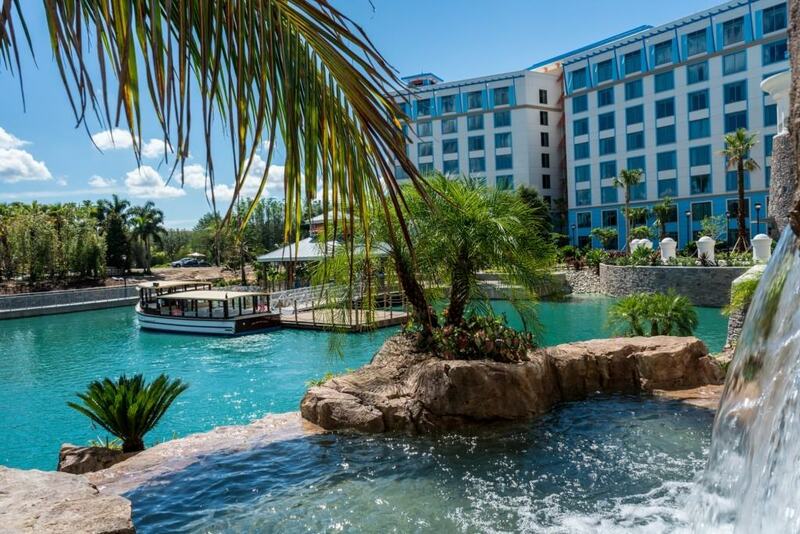 On this page, we are going to discuss official Universal Orlando Resort vacation packages, their benefits, how they work, and whether you can actually save money by booking your travel as a package through Universal. The purpose of this page is to give you the insider tips, tricks, and secrets about these packages. That being said, it’s important to note that any price, procedure, or policy related to Universal vacation packages may change at any time – so, please, before you make any final decisions, contact the company or your travel agent directly. What, exactly, is a Universal Orlando vacation package? 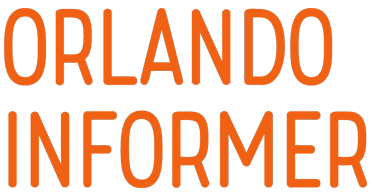 Universal Orlando vacation packages present you with a way to “bundle” the components of a Universal vacation into one, well, package. In its most basic form, a vacation package must include accommodations (either at one of Universal’s on-site hotels or one of its partner hotels) and theme-park tickets. In addition to these two basic components, a package may also include additional entertainment (Blue Man Group tickets, etc. ), car rental, transportation to Walt Disney World Resort, and, even, airfare. How do I book a Universal Orlando vacation package? 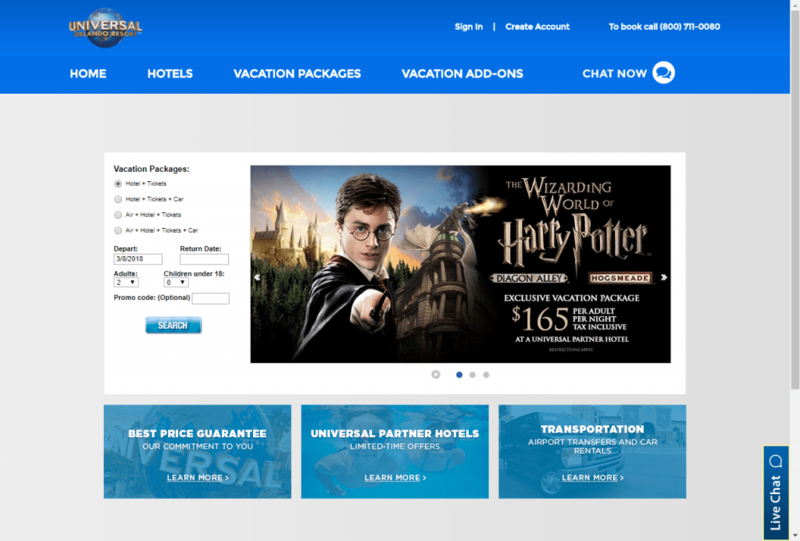 There are two primary methods for booking Universal Orlando vacation packages. The first – and, for many, the easiest – is through a travel agency. The second option is to go directly through Universal Orlando. 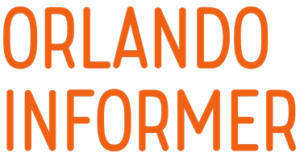 This can be done via its website, UniversalOrlandoVacations.com, or by calling the vacation-package department at 800-711-0080. If you do the latter, you’re actually contacting Universal Orlando’s Guest Contact Center, and your call is routed to a Guest Contact Center team member who is trained in the subject. It’s important to note that, in general, the price of a Universal vacation package is the same for guests whether the package is booked by a travel agency or directly through Universal – in other words, if you decide to use a travel agent, Universal pays them a commission on the money that it would otherwise keep. The takeaway is that you, as the guest, will pay pretty much the same thing either way you go. One more idea to consider when choosing a method of booking your package: travel agents make a living by ensuring that each one of their clients’ specific travel needs is met. What’s the point of booking a Universal Orlando vacation package? Now we get to perhaps the most important question(s): what’s the point of booking a Universal Orlando vacation package, and is it worth it? First off, it’s important to dispel a very popular myth: booking a Universal Orlando vacation package means that you are saving money. We’re sorry to say that this is not true. Even though it feels like you are bundling the components of your trip, so you ought to save, bundling doesn’t mean saving in this case. The truth is, if you were to purchase the parts of your Universal vacation separately, you are likely to come up with close to the same price. And in the times that you come up with a different price, more often than not that number will be lower than the package total – particularly if you are able to get your admission tickets from AAA. So, what’s the point of booking a Universal Orlando vacation package, then? There are three real reasons to do so: (1) to gain access to Early Park Admission at The Wizarding World of Harry Potter and Volcano Bay; (2) to make a guaranteed reservation for breakfast one morning at The Three Broomsticks and/or The Leaky Cauldron; and (3) to have a single point of contact for the different components of your Universal vacation (at least, until you get on-site). Let’s look at each of these benefits a little more closely. Unless you are coming to Universal Orlando Resort when you are certain it will be very slow, or unless you just don’t care about Harry Potter, having Early Park Admission to the Wizarding World is an essential factor to ensuring your vacation is a success. As of right now, there are three ways to get EPA, starting with staying at one of the on-site hotels: Portofino Bay Hotel, Hard Rock Hotel, Royal Pacific Resort, Sapphire Falls Resort, Cabana Bay Beach Resort, Aventura Hotel, or Endless Summer Resort – Surfside Inn and Suites. All guests staying on-site, regardless of how they booked their room or whether or not they have a vacation package, get early admission. The second way is to book a vacation package that includes one of Universal’s 40 or so partner hotels, which are off-property venues that Universal has contracted with to sell their rooms. It’s very important to note that you must book accommodations at a Universal partner hotel as part of a Universal Orlando vacation package to get Early Park Admission. So, if you want to stay at the DoubleTree across from the entrance to Universal and you want EPA, you must book a Universal Orlando vacation package with the DoubleTree as your hotel; if you just book the hotel on your own, and purchase your own theme-park admission tickets, you will not be granted early entry. The third way is to have an annual pass. Both Preferred and Premier Passholders receive Early Park Admission to The Wizarding World of Harry Potter. However, be aware that Preferred Annual Passes have blockout dates for this perk, and that no APs are eligible for Early Park Admission to Volcano Bay. Finally, keep in mind that Early Park Admission is a benefit included with all vacation packages, no matter their names or exact configurations. 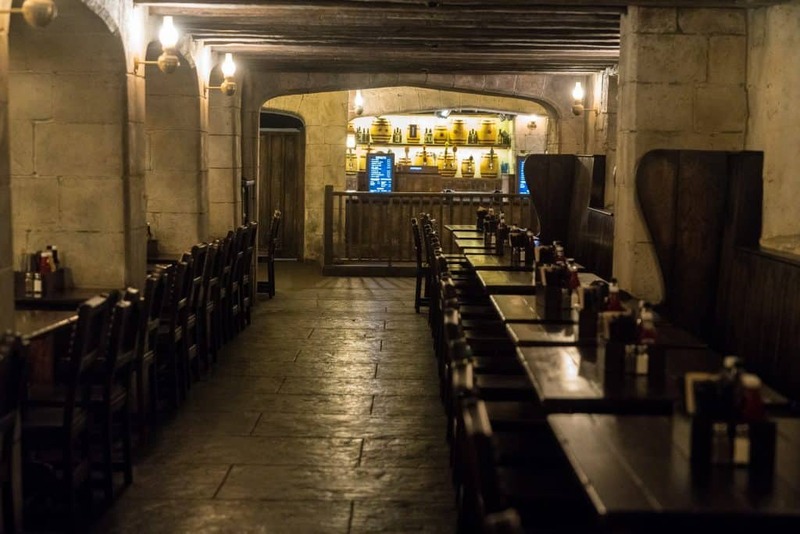 Being able to set up a reservation for breakfast one morning at Three Broomsticks and Leaky Cauldron is a special benefit of just one particular offer, The Wizarding World of Harry Potter Exclusive Vacation Package. This isn’t as necessary as it once was, when both Hogsmeade and Diagon Alley were brand-new, but it still can come in handy during the busier times of the year, when you won’t just be able to waltz in. Is there any other reason to book a Universal Orlando vacation package? You now know that you are not really going to save any money by booking a vacation package – in most cases, you may end up paying a little more. The real reasons to book a package are either to get Early Park Admission to The Wizarding World of Harry Potter and Universal’s Volcano Bay if you are staying at an off-property hotel, or to get reservations for during your trip. But there must be other reasons, right? The truth is, there really are not. For example, if you book a vacation package, you get complimentary access to the nightclubs at Universal CityWalk. But you get that same complimentary access if you purchase a Park-to-Park admission ticket from Universal anyway. Or if you purchase Blue Man Group tickets. Or, you can purchase the pass alone right at CityWalk for about $10. The point is, complimentary access to the nightclubs is not much of a reason to get a vacation package. The only thing we can add is that, as we mentioned above, booking a package does give you one point of contact. So if you have issues with your admission tickets, or hotel, or if you want to talk to someone about the dining options at Universal, you can just call your travel agent or Universal’s vacation-package department. What are the different types of vacation packages available? This is Universal’s basic vacation package. As such, it includes the basic components: hotel accommodations and theme-park admission (and, of course, Early Park Admission to The Wizarding World of Harry Potter and Volcano Bay). Stay and Play is the most flexible package, meaning that you can book it for as many nights as you want, and add and adjust its components, just as long as there is one night at a hotel and one park ticket somewhere in there. All of the other vacation packages offered by Universal Orlando are basically variations of this one. Like Stay and Play, this package includes hotel and park admission, but for a slightly higher price that is hidden in with the cost of the hotel, it also includes breakfast at The Three Broomsticks and/or The Leaky Cauldron. Because The Wizarding World of Harry Potter is so incredibly popular, Universal often requires a four-night stay to book this package. If you don’t want to stay for that long at Universal, book the Stay and Play package, and all you lose is the one-time breakfast at Three Broomsticks and/or Leaky Cauldron – and, remember, you’ll probably be able to walk in for breakfast without a reservation (or you could always just have lunch or dinner at these venues). Universal’s Florida resident packages are exactly like the Stay and Play one, except the hotel rates can be slightly less if the hotel you choose is offering a Florida-resident discount. It’s worth noting that Universal’s Florida-resident discount tickets can be added to any vacation package, making the “Florida-resident vacation packages” rather unnecessary. During special events, such as Halloween Horror Nights, or for new promotions, Universal may offer special vacation packages. To differentiate them from Stay and Play, these specialty packages usually offer one additional benefit, such as a complementary character photograph or access to an otherwise-private activity. But be cautious about the complementary or exclusive benefits included in these packages – the cost for them is often hidden within the cost of the hotel (which means you’re paying for them, anyway), or, in the case of a private event, there are often other methods for getting in. For example, Halloween Horror Nights Hotel and Ticket Package usually includes four-night hotel accommodations, four-day park-to-park tickets, one-night admission to HHN, and a CityWalk Party Pass. When you purchase this package, the advertising gives the impression that, somehow, you’re saving money by bundling – but you’re not; you can easily book all these features on their own and, with a little research, come up with equal prices.